Welcome to the relaxed and joyful wedding of our real bespoke bride Phoebe and Guy. This gorgeous September wedding took place at the stunning London wedding venue of Morden Hall. This romantic country house, built in 1770, provided the perfect setting and natural environment for this relaxed and fun-filled wedding. The wedding breakfast was full of laughter and the party continued well into the evening.. 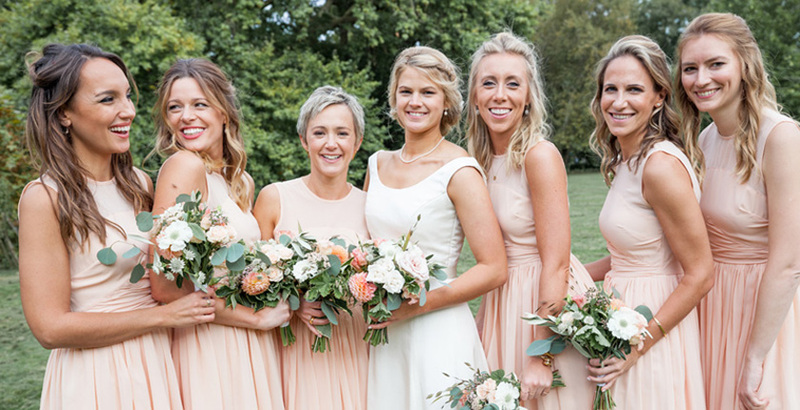 The bridesmaids wore soft peach short dresses, and held country flower pastel bouquets. Phoebe included charming touches such as baskets of natural petal confetti, and sweets for the guests. Phoebe designed her own wedding dress with our Couture Kit web app, and chose a soft ivory crepe for her elegant, relaxed wedding dress. We made to measure this lovely wedding dress with straps and the fittings took place at our London bridal boutique at Ham House in Richmond.